He said that Bundesliga was working in close cooperation with IMG-Reliance on strategy development and local execution. For development of football in India, Eintracht Frankfurt will scout for 20 Indian players who will be taken to Germany for training this year, he added. The focus, he said was on being present where the fan is, club tours and close coordination with clubs, fan events and grassroots and CSR projects. Mr. Subrata Dutta, Senior Vice President, All India Football Federation (AIFF), said the federation had launched its four-year strategic plan (2019-22), under which four new FIFA approved venues would be developed. The National Centre of Excellence was coming up at New Town in Kolkata to provide state-of-the-art facilities for players, coaches and officials, development of accredited academies, he added. He underlined the need for proper coordination and communication by all stakeholders in alignment with AIFF’s strategic plan. Mr. Rohit Bhardwaj, Director – Sports, Ministry of Youth Affairs and Sports, Government of India,pointed out that sport was a tool for peace and development, and it was recognised as such by the UN for attaining the Sustainable Development Goals (SDGs). Indian football, he said, was on the verge of taking a big leap forward through the government’s ‘Khelo India’ programme which was now scouting for talent at the grassroots level. Ms. Sara Pilot, Chairperson, Women’s Football Committee, AIFF, expressed confidence that women had the ability to excel in the sport and could effectively occupy the football space in India. If girls were given the opportunity to play, the movement could galvanise the country, she said and emphasised the need to have women role models to popularize the sport. Mr. Siddhartha Upadhyay, Co-Chair, FICCI Sports Committee & General Secretary, STAIRS, said that India was producing new heroes not just from the grassroots level but also from amongst the white collared and these were set to change the course of Indian football. Mr. Chanakya Chaudhary, Co-Chair, FICCI Sports Committee & VP, Corporate Services, TATA Steel, gave a vote of thanks. 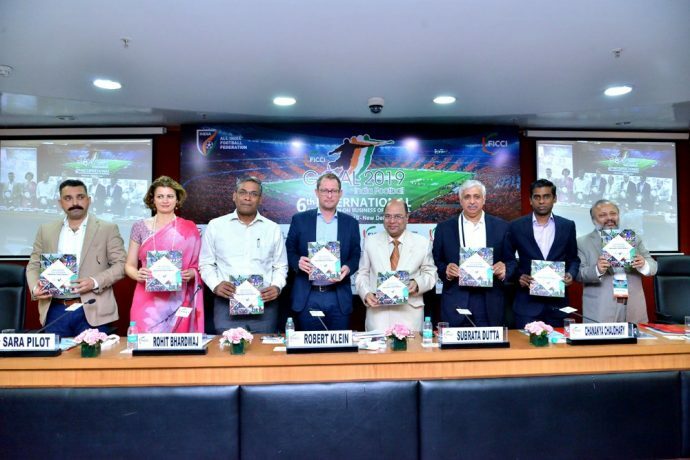 On the occasion, a FICCI-World1 Sports Knowledge Paper titled, ‘Decoding the Enigma-Indian Football’ was released. The Knowledge Paper states that Indian football is in a state of ascendancy and the commitments made by large corporate houses seems to indicate that there is no turning back now. It envisions that investors will efficiently and effectively utilise their funds for developing footballing infrastructure keeping in mind both the quality and quantity required. It notes that today football fields exist in our county. However, they are often used for purposes other than football which leads to high deterioration of the quality of the pitches. Additionally, often where high-quality football pitches are available, their accessibility is restricted especially for the marginalised communities. Another role that infrastructure plays, is giving communities a place of their own with which they can attach their emotions and memories. Community building is as much a goal of football, as is on the ground achievements. The paper puts across the fact that promoting football is not just for the benefit of our country’s sporting success and the development of professional players. Football is a medium for bringing about positive change in society and individuals, whether they are young recreational players, their parents, fans or consumers. It states that the challenge before all of us is to ensure that we keep the momentum going by finding ways in which investors can invest in football as they would in any other business by making it profitable for them. It is only then that we will see the sort of cash influx that is needed to develop the sport both at the professional and grassroots levels.